Union Bay landowners have been fighting each other for years over a $1.4 million dollar interest free loan from a developer who would own the facility on the developer leased land and only good for 5 to 7 years. We have $2,268,783 total in reserve funds. Why have we been fighting over an interest free loan? That’s the crazy part. Ted Haraldson should be embarrassed by the following which is being distributed expecting people to vote for him based on this bizarre rant. Obviously, it was written by Lone Jednorog as it is identical to the misinformation posted on her website. Describing the actions of the board member who has tried to correct the numerous mistakes made by Jacques during the meetings as distractions rather than accuracy says a lot about Haraldson as a candidate. Calling letters old which went unanswered from Aug. 2016 until Nov. 2016. Because the Nov. 2016 answer was still unsatisfactory, Haraldson wants you to ignore the errors publicly stated by trustee Glenn Loxam and claims progress isn’t being made due to a trustee expecting an honest answer. Trustees Kaljur and Elliott have pushed for the board to follow the path established by the previous board but Jacques, Bitten and Loxam dug their heels in and refused to consider any other option other than the OLD EXPIRED 2011 WIA which everyone knew had expired except Brian McMahon, VP KIP, trustees Peter Jacques, Glenn Loxam and Rick Bitten. So tell me, who was stuck in the past? Is Haraldson referring to the fact Jacques, Bitten and Loxam managed to vote for the old agreement in November 2016? “she hasn’t succeeded and the men pulled through.” Not really, since the men looked completely foolish when the lawyer sent back a letter telling them they couldn’t resurrect the old agreement. 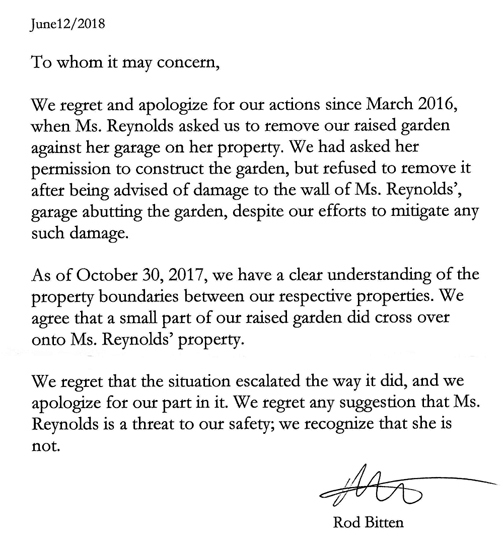 Now Bitten is claiming their motion was to ask the lawyer for advice! More alternative facts. Bitten states the 50% turnout to vote in the Oct. 2016 by election told him that the ratepayers wanted local representation. Wrong again Rick. People voted because it’s their right to vote. A high voter turnout is what is always desired and a good indicator that people care and take the time to cast their ballot. It is not an indicator for or against local representation. It is an indicator of a more involved electorate. 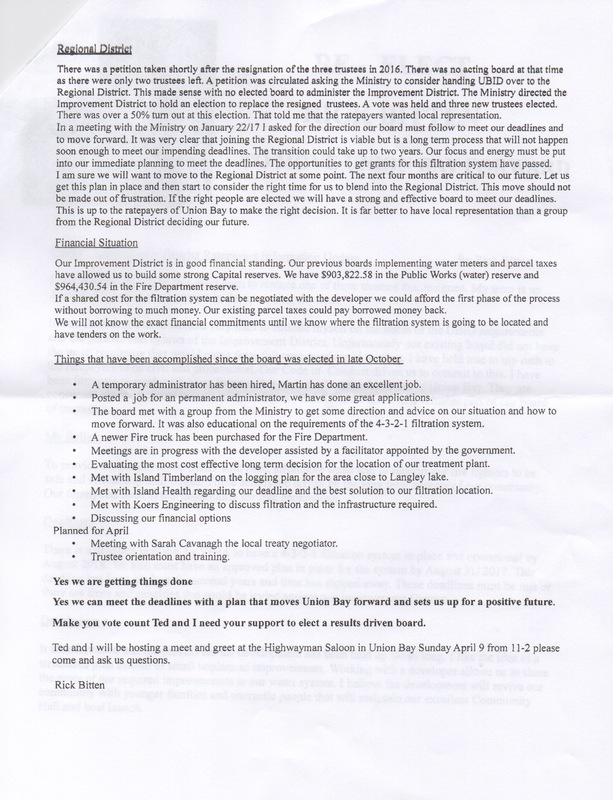 Bitten’s claims about the Regional District not helping us was shot down by MLA Scott Fraser who explained another improvement district was taken over by the Regional District in their area because they faced the same water issues as Union Bay and funds were made available to assist that community, and it was all done in less than 2 years. Bitten wants to dismiss the landowners who signed the petition to join the Regional District claiming the decision was made out of frustration. I think it’s more like fed up with the antics of Kensington Island Properties trustees Peter Jacques and Glenn Loxam who campaigned on one issue: the Expired 2011 WIA. Jacques and Loxam were in a CONFLICT OF INTEREST when they secretly negotiated an agreement June 7, 2016 with KIP without the authorization of the Union Bay Improvement District Board of Trustees. I love this one: “our previous boards implementing water meters and parcel taxes have allowed us to build some strong Capital reserves. ” Wrong again Rick. UBID was just about bankrupt in April 2011 when Carol Molstad and Anne Alcock were elected to the board joining Trustees Bruce Livesey and Cleve Goldswain with Marie Gaudreau being elected to replace Alan de Jersey who resigned the same year. The credit for our financial position is because of these five people. Up until 2011 the previous board spent like drunken sailors and cost landowners hundreds of thousands of dollars including the purchase of the school property without using a lawyer and doing their due diligence as trustees representing the community. Look at the proof of the total in reserve funds as of Dec. 31, 2010. A total of $440,751. after years of trustees having the same attitude of ridiculous spending habits and careless attitude towards rules and regulations while supposedly representing the landowners. From 2005 until April 2011 it was pretty well the same core people on the board all agreeing to spend money and increase their powers and responsibilities. They implemented the First Responders which took a good chunk of dough for special vehicles and training, always wanting to increase the areas of coverage. No planning for infrastructure choosing instead to believe KIP was going to provide all the needs of Union Bay. Look at the total in reserve funds as of Dec. 31, 2016. A total of $2,268,783 saved in 6 years and this in spite of the hundreds of thousands lost on the school purchase and the law suits against SD 71 and the notary. Even if you give Rick Bitten’s praise of those old boys and deduct the $440,751. You still have $1,828,032. that was saved by Past Trustees Carol Molstad, Anne Alcock, Alan Webb, Bruce Livesey and Marie Gaudreau. The very people who were doing an amazing job were subjected to the lies spread by KIP and endured the wrath of the hillbillies who drank KIP’s kool aid. Voted to resurrect the almost 2 years dead and expired 2011 WIA putting landowners at risk of being sued as the landowners of Naramata were when they could not provide the promised water to the developer just like Bitten voting for an agreement which promised 500 connections which violated our water license. Voted against forming a committee to look at the pros and cons of joining the Regional District. Voted against reality by refusing to correct the minutes of the Dec. 2016 meeting which didn’t show Trustee Kaljur as present at the meeting. Trustee Kaljur was 1 minutes 19 seconds late for the meeting and trustee Loxam kept saying she was late as though that justifies the minutes reflecting her absent. Has talked at every meeting about forming committees and done absolutely nothing. Takes credit for the work accomplished by the previous five trustees who put us on the path to owning the water treatment facility on UBID’ own land. Ignores the last 2 years of wasted time due to the false promises that got Loxam and Jacques elected promising something that was not legal and intentionally misleading. Trying to pass off as accomplishments the items listed below which are clearly not items that takes months but are typical of trustee actions. How long did it take to hire a temporary Administrator when you are given a list to choose from by the Provincial Gov’t? Posted a job for a permanent administrator – Wrong again Rick. You didn’t post the job, Martin the temporary Administrator posted the job. How long did it take to meet with a group from the Ministry to get some direction and advice? Surely this was accomplished in less than a day. Fire truck purchase – I believe the credit for this goes to the Fire Chief who brought it to the board’s attention. How much time did that involve on the trustee’s behalf? Meetings are in progress with the developer – Wrong again Rick. That’s not an accomplishment since you seem determined to give the developer whatever he asks for and the facilitator who Rick claims was a waste of $60,000 has been involved for over a year now with zero results because KIP cried to the Provincial Gov’t. Evaluating the most cost effective long term decision. When did Rick start evaluating this problem since he was adamant up until late November 2016 that a temporary system owned by KIP on KIP’s leased land insisting there was no alternative? 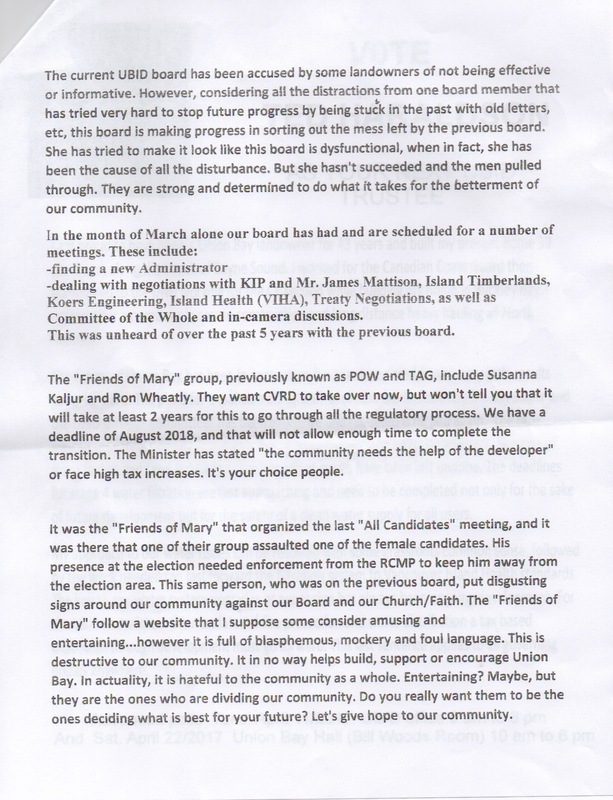 Met with Island Timberland, met with Island Health, met with Koers Engineering (note: the letter from landowner Janet Thomas specifically mentioning Koers was the letter incorrectly answered by chair Jacques which resulted in Jacques losing it and abruptly ending the Dec.2016 meeting). These are all followups on the plan put in place by the previous board mentioned above. Bitten lists Discussing our financial options. These are not accomplishments considering it’s been 6 months and this is everything he could possibly list! Bitten, Loxam and Jacques had absolutely no plan other than approve the old agreement and we would be desperate right now if it hadn’t been for the plan already put in place by Carol Molstad, Anne Alcock, Bruce Livesey, Alan Webb and Marie Gaudreau. This is the plan Bitten, Loxam and Jacques are now following and trying to take credit for the work already accomplished.